UVU President Matthew Holland will leave the university to serve as a LDS mission president in 2018. 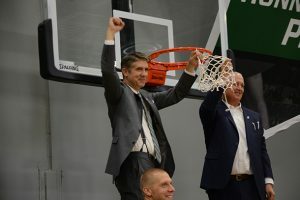 Utah Valley University President Matthew Holland will leave the university in June to serve as a mission president for The Church of Jesus Christ of Latter-day Saints, UVU announced Monday morning. 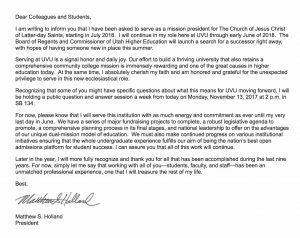 Holland will continue to serve as UVU’s president through June 2018 before beginning his mission president duties in July. While the LDS Church announced Holland would preside over an English-speaking mission, the Church will not announce the specific location until later in the year. 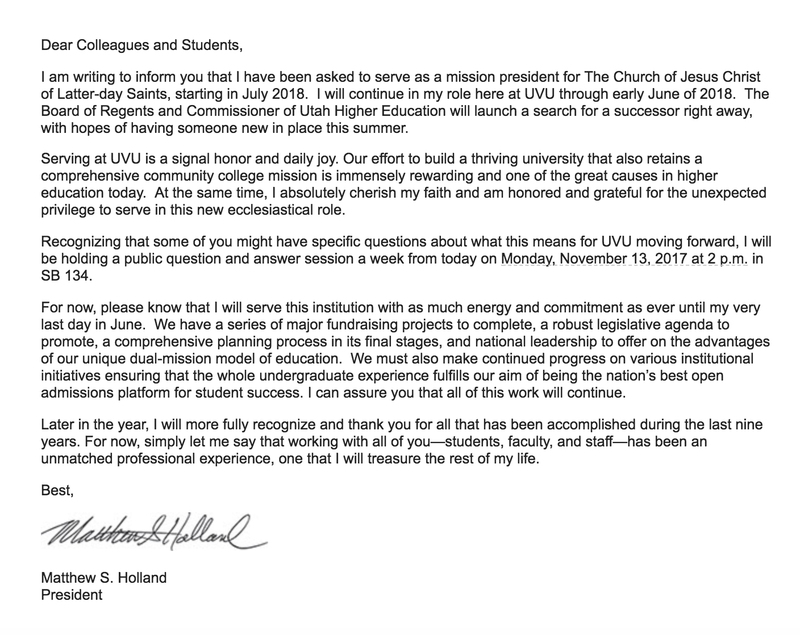 In a letter to UVU students, Holland told the students that the Board of Regents and Commissioner of Utah Higher Education will immediately begin its search for a new UVU president. David L. Buhler, Utah Commissioner of Higher Education, said in a press release that the university will announce names of potential replacements in the near future. 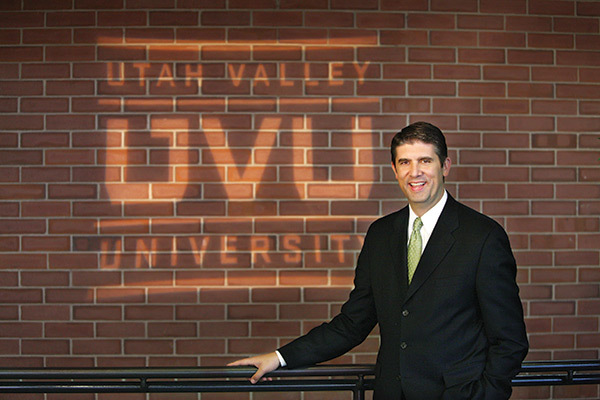 Holland was appointed the sixth president of Utah Valley University in 2009. During his time at UVU, President Holland saw the university rise to the largest university in Utah, with more than 37,000 students. 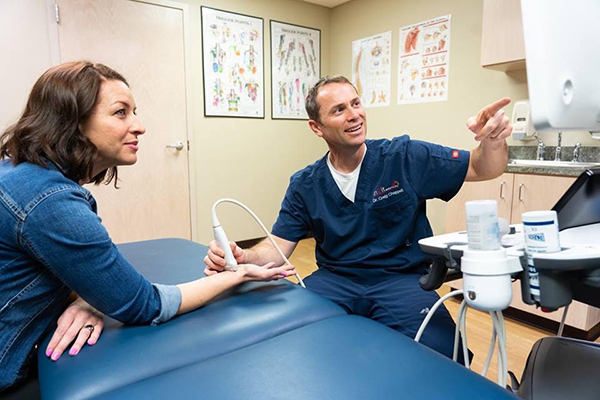 During his tenure, academic offerings expanded to 44 certificate programs, 62 associate degrees, 84 bachelor degrees, three graduate certificates, and eight master degrees. 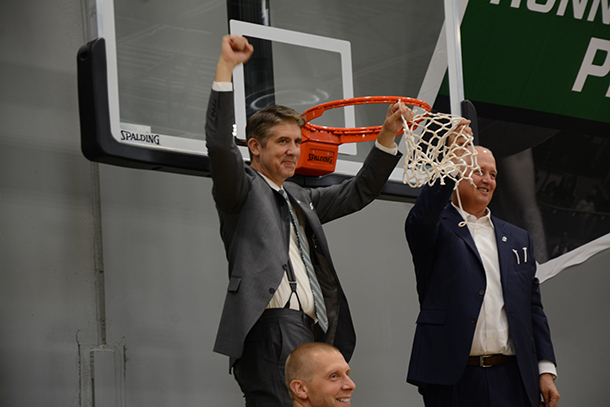 In the 2014 legislative session, UVU was awarded a $21 million new, ongoing funding to put UVU on a more equitable level with the other institutions in the Utah System of Higher Education. Also in 2014, UVU acquired 225 acres of land on the old Geneva Steel site in Vineyard. Holland worked with Tom Holdman to bring “Roots of Knowledge” — 80-panel, 60,000-piece Roots of Knowledge glass installation on the western wall of the UVU library — to campus. During his tenure, 12 new buildings have broken ground on UVU’s campus: Science Building, Classroom Building, Student Life and Wellness Building, NUVI Basketball Center, Barbara Barrington Jones Family Foundation Wee Care Center, Noorda Center for the Performing Arts, Facilities Building, Business Resource Center, Cole Nellesen Building housing the Melisa Nellesen Center for Autism, Becky Lockhart Arena, a major pedestrian bridge connecting east and west campuses over I-15, and the campus’s first parking structure. 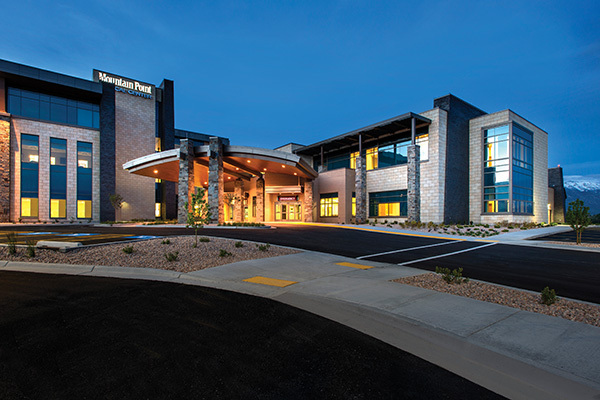 Holland was nationally recognized for instituting UVU’s dual-mission model of providing services of both an outstanding teaching university and a comprehensive community college. 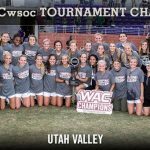 Holland will hold a question and answer session with students on Monday, Nov. 13 at 2 p.m. in SB 134 on UVU’s campus.